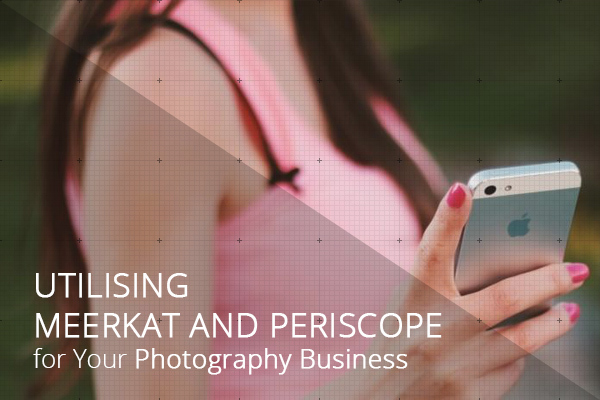 In this article we’re going to talk about Periscope and Meerkat apps and how a photographer can benefit from these services. Use technologies of the future to grow your business! 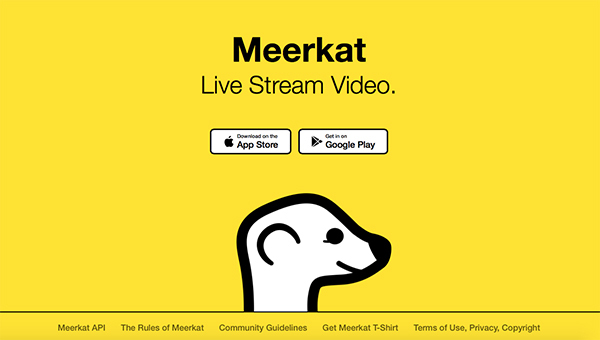 Meerkat is a live video streaming app. It’s available on iOs and Android. 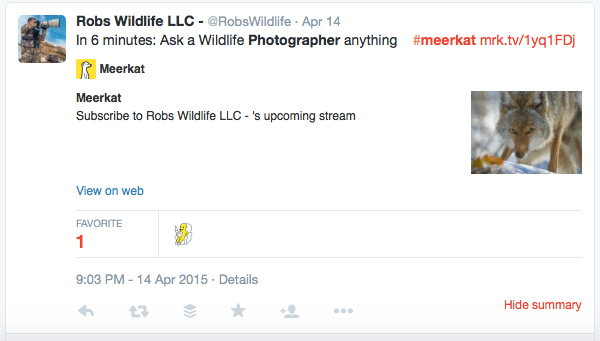 Meerkat links directly to Twitter profiles, which lets people stream a live video to their followers. 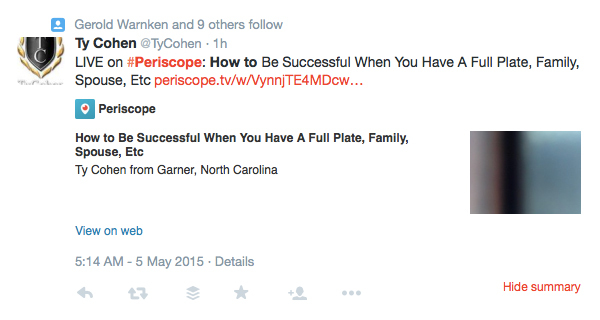 Periscope is a similar video streaming app. It was purchased by Twitter for a reported $100 million in early 2015. With arriving of these apps live-streaming videos from smartphones seem to be the latest craze. People record everything from thunderstorm in Seattle to building on fire in New York to let everyone see the world with their eyes. When you start your “broadcast” your followers get notified about that. So, they are able to tune in and make comments in a chat feed which you and your viewers can see on the screen while you’re broadcasting. Of course, live-streaming videos from smartphones is not an innovation. But mobile internet connection and improvements of mobile camera quality offers a great opportunity to share everything you want anywhere and anytime. Like you may already read in app’s Rules of Meerkat that everything that happens on Meerkat (or Periscope) happens on Twitter. This feature is one of the best ones as it allows to hit the ground running. By using the existing fan base of Twitter, you don’t need time to build an audience that has been already built. They just log in and start streaming. The app tweets all your followers a tweet “LIVE NOW” so everyone know that you started a broadcast. While Meerkat and Periscope are all over the Internet right now, these are still brand new apps and if you haven’t yet figured out how you might utilize them for your photogaphy business, look no firther.Here are at least 5 ways you can use these Twitter-connected apps to boost your photo brand. Of course, there is nothing new about educational videos. However, Meerkat and Periscope can change them forever. For example, if you do something that is really difficult to explain, it’s better to show it to your followers. So, you can broadcast anytime you want and your followers get notified that you’re online. Sometimes you think how to help people to do something by showing them. 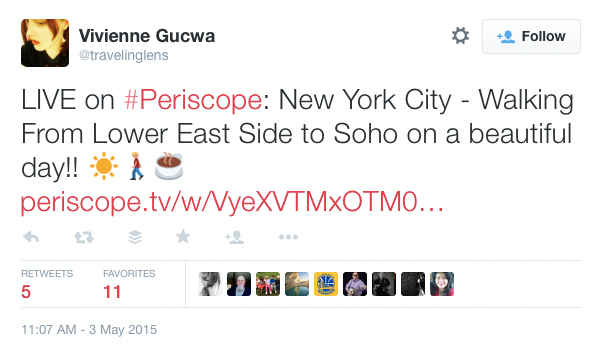 With Meerkat and Periscope that’s as easy as ABC. 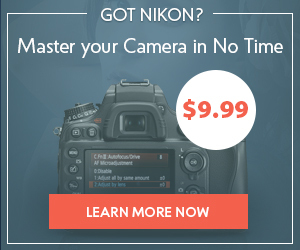 You don’t need to spend time on uploading and editing video. 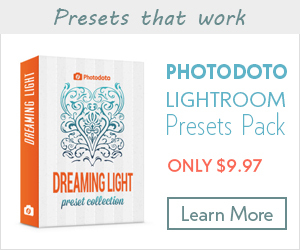 People always are wondering what’s happening on photo sessions, so let them peek at you behind the scenes. Just imagine a few minutes of a streaming live video of a photo session where people may turn in and comment: “Professional as always”, “Work it!”, “You go girl!” and so on. That sounds like fun. You may use Meerkat (or Periscope) to get to know people you wanted to know for a long time, like a favourite blogger or a photographer from your area. Also, these apps can help other people get to know you. People who follow you on Twitter, but don’t know your personally will have a chance to see you in real life while you’re broadcasting on Meerkat. It’s a great opportunity to chat and meet new friends who share your interests and even meet new clients. Of course, not all of us are travel photographer and in fact, not all of us travel a lot. However, if you do, share the most exciting moments with your Twitter followers using Meerkat. Of course, Instagram is fine for sharing, but still images do not talk or move. These real-time video streaming can cost a diamond to see and feel. Fans of your work will feel even more connected if they can get a peek in on what’s going on live. 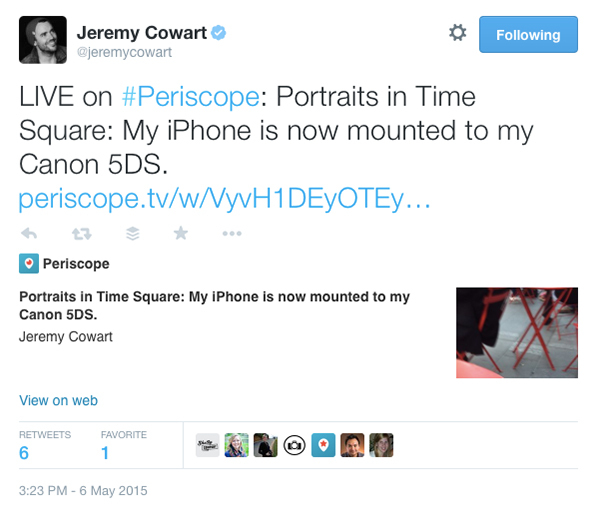 Some top famous photographers use Periscope and Meerkat. The best thing about it, you are able to ask questions during the broadcast and get your answers at once. Follow photographers whose work you like and you’ll get the opportunity to chat with them. This way you can learn from gurus for free. 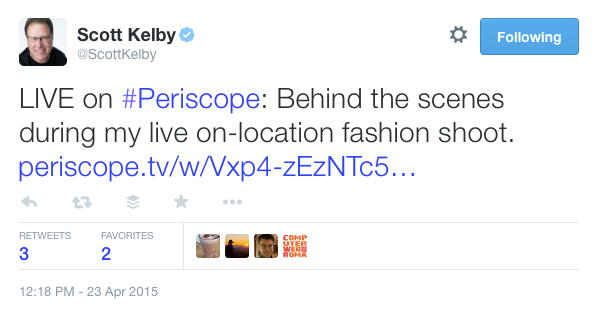 Unfortunately, there is no chance to see Priscope and Meerkat videos after the broadcast is over. However, you can have an idea of what it was about from the related tweet. 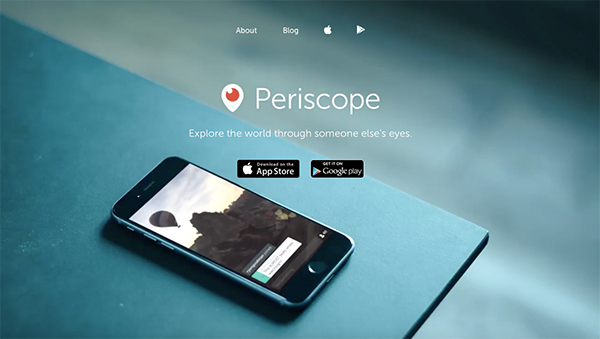 Below are some examples of Periscope clips from photographers for you to get inspired. 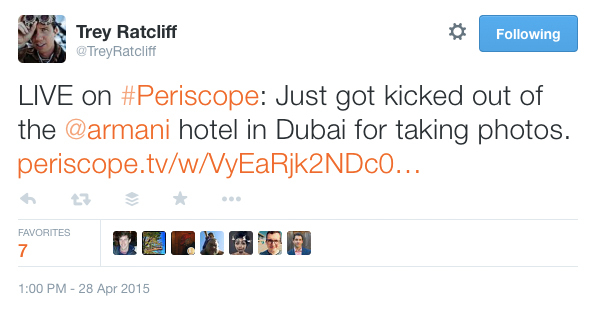 Trey Ratcliff shares his travelling experience using Periscope. His followers were able to see how Trey got kicked out from Dubai hotel for taking pictures. 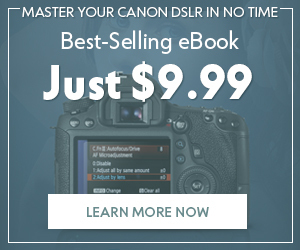 Jeremy Cowart shows how he took pictures on Time Square with iPhone mounted to Canon 5DS. 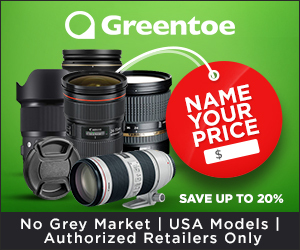 Scott Kelby allowed his fans to take a sneak peek behind the scenes during a fashion photo shoot. Kyle & A.J. Dunlap is a husband & wife photography team. They shared with Periscope what’s inside photographer’s bag while shooting a wedding. Vivienne Gucwa is a photographer, best-selling author and a traveler. She uses Periscope to share her creative vision of the world. 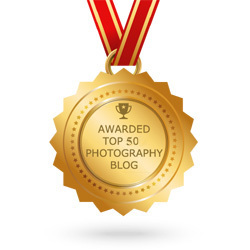 New technologies bring new possibilities to grow your photography business and it’s important to stay tune. I hope this article will inspire and motivate you to bring in new apps like Meerkat and Periscope to your workflow routine and let your business grow.